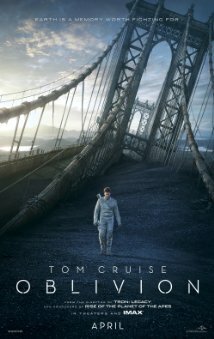 A blockbuster adapted from a book that never existed, Oblivion is a story with potential obviously told in the wrong medium. Based on the unpublished graphic novel by director Joseph Kosinski, the film follows Jack (Cruise), one of the last remaining men on Earth who is ordered by space station Tet to act as security and repairs for pods extracting the last remaining resources from earth’s core and sending them to Titan. Him and his companion Victoria (Riseborough) had their memories wiped as part of the mission, and all they know is that the earth was attacked by alien Scavs who blew up the moon. Earth was then left uninhabitable by a series of nuclear attacks, and the survivors moved to Titan, a moon of Saturn, to start again. Jack and Victoria are two weeks away from completing their patrol and moving to Titan, but when he investigates a crashed ship in his patrol and sees the drones he works with shooting other humans, he starts to question who he’s working for. This is definitely one of those stories that chops and changes as the film develops, changing your ideas about the characters as the plot progresses, which is always impressive in film. I think the story itself is a good idea, but the problem with trying to explain a brand new idea to people, then develop the plot and everything else, all in the space of two hours, is that unless it’s incredibly written people will get lost. It definitely wasn’t the easiest story to follow, and although I got enough to understand the story I definitely feel like I’ve missed some of the deeper parts of the story. And before you think I’m stupid, type ‘Oblivion movie’ into google and the next suggestion is ‘Oblivion movie explained’. I think most people will be the same – they get the story, but missed out on details that would have given the story much more weight. The acting in Oblivion is solid. Tom Cruise is Tom Cruise, the same Tom Cruise from every other Tom Cruise movie. That’s not to say he was bad or anything, he’s just got a natural style that is made for cinema, and has made a big enough name for himself that he can deliver the same performance in this as he has done in everything else I’ve seen. Morgan Freeman brings his trademark acting style to a more rugged, more dangerous character than I’ve seen him play before and overall he does a solid, if unremarkable job of it. I was quite impressed by Andrea Riseborough though! I don’t feel like I’ve seen her play such a big part in a film before, and she made the most of her screentime by delivering an intelligent, emotive performance that shows the great range she can deliver in one showing. On the other side of things, I’m not really sure how much Kurylenko actually did, considering she is the centre-point and lynchpin of the whole story. Maybe that’s the writers fault, but she had a character with a lot of potential, but in the end didn’t really do enough to make an impact like Riseborough did. The directing by Joseph Kosinski is good. Obviously there’s a lot of story to tell so Kosinski, possible aware there’s too much of it, tries to tell as much as he can through very crisp visuals (kudos to FX team) and does a good job of it considering. The whole flashback sequence was particularly clever, turning from black and white to colour as it starts to make more sense. He also does a good job with the basics, adding more emotion and intrigue to otherwise basic scenes. It is worth noting that Kosinski also directed TRON: Legacy (2010), and although I never saw it, I can imagine there’s a lot of similarities in style between the two sci-fi movies. Overall, the only thing stopping this from being a great, or maybe even a good movie is the story. It’s good, but I feel like they’ve bitten off more than they could chew with everything that’s going on in his world. I think this is definitely a story for a graphic novel, not for a film. Kosinski had it right the first time! Before you go, I thought I would share a song from the soundtrack to Oblivion. This is playing during the closing credits (I’m not sure where else in the film) and is a really good song! It’s called Oblivion (appropriately) and is by French group M83, most known for their song ‘Midnight City’. I urge you to take 5 minutes to listen to this, you’ll feel better for it!